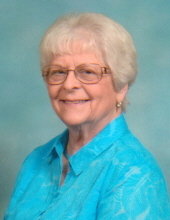 Age 84 of Owosso passed away Thursday, March 28, 2019 at Hospice House of Shiawassee County. Funeral Services will be held 2pm Monday April 1, 2019 at Nelson-House Funeral Home with Pastor Dean Rhine officiating. Burial will follow at Hillcrest Memorial Gardens. The family will receive friends at the funeral home on Monday from 12noon until the time of service. Carolyn was born September 29, 1934 in Owosso, the daughter of George and Retha (Hoenshall) Bosserdet. She graduated from Owosso High School; Class of 1952. Carolyn was a member of the Bethel Free Evangelical Church. She married Robert Mitchem in Angola, Indiana on October 26, 1957; he predeceased her on October 16, 2011. Carolyn worked at Midwest Abrasives for 29 years. Carolyn is survived by her children Debra Bliss, Mitchell Koyne, Sherrie Mitchem and Lori Sanderson; sister Margie (Ray) Conner; grandchildren Stephanie (Jeff) Bucknam, Ryan Koyne, Robert Koyne and Tyler Koyne; and many other loving family and friends. She was predeceased by her husband; her parents and her brother George Bosserdet Jr.
Memorial contributions are suggested to Bethel Evangelical Church or Hospice House of Shiawassee County. To send flowers or a remembrance gift to the family of Carolyn Mitchem, please visit our Tribute Store. "Email Address" would like to share the life celebration of Carolyn Mitchem. Click on the "link" to go to share a favorite memory or leave a condolence message for the family.